From Apalachicola to St. George Island, the Sunshine State’s Franklin County offers a no-fuss, no-muss vacation. Florida’s lush gulf coast offers a bountiful bevy of fun-in-the-sun options, many of which boast numerous activities to keep everyone in your family busy on vacation. But once in a while, it’s nice to travel to a place a little more remote and quiet so you can spend a few days just relaxing and enjoying truly concentrated family togetherness without the whirlwind of things to do. If you want to slow things down a bit on your next family getaway jaunt, consider Florida’s beautiful Franklin County, comprising Apalachicola, Carabelle, Alligator Point, Dog Island, St. Vincent Island and St. George Island. Apalachicola’s bay is a big oyster hot spot. In fact, 90 percent of oysters consumed all across the state of Florida come from this bay as does 10 percent of oysters eaten across the entire United States. The oysters here are like no other, sweet and non-gritty. They are a true culinary delight whether you like them raw or cooked a variety of ways ... and yes, plenty of kids love slurping them down, too! Although relaxing and playing on the beach are the big attractions in the area, there are certainly a few things that you should add to your to-do list. First is the Apalachicola National Estuarine Research Reserve, residing on 246,766 acres. The education center there includes an incredible museum showcasing the area’s wildlife and ecosystem. You’ll also want to embark on Captain Gill’s River Cruises aboard the 28-foot “Lily.” Hang out inside the air-conditioned cabin on this two-hour sight-seeing eco-tour and learn about local folklore, or climb up to the upper deck and bask in the beautiful Florida sunshine while taking in the lush environs. True nature enthusiasts should book the sunrise kayaking excursion with the Apalachicola Maritime Museum. This early morning kayak trip (available daily) up Scipio Creek is incredible. The scenery can’t be beat as you paddle along, watching the sun rise as it spreads its light and warmth across the waters. Apalachicola itself is home to several quaint shops, galleries and eateries. It’s definitely worth an afternoon of your family’s time, no doubt. But if your family is going to go to Florida’s Franklin County, St. George Island is the place to be. 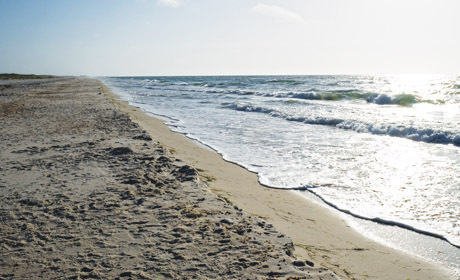 St. George Island is by far the most gorgeous natural stretch of beach in Florida’s gulf. It's serene, unspoiled and non commercialized, and therein resides its charm. It proves you don’t need an amusement park, go karts, etc., in order to have a great time. Rent a bike and pedal around the island, tour the Cape St. George Lighthouse, play on the beach, enjoy a swim in the gulf waters, embark on a guided kayaking trip, test your skills on a stand-up paddleboard or set out on a fishing adventure in the bay. St. George Island State Park offers hiking, biking, canoeing, picnic areas and a family campground for those who enjoy pitching a tent and going the rustic route. Accommodations are plentiful on St. George through Collins Vacation Rentals. Choose from five- to seven-room beach homes, villas, condos, town homes or an old Florida-style cottage. Should your family make the trip, I’m sure, like me, it will become your favorite beach spot in Florida. Find more info and a visitor’s guide at saltyflorida.com.